So much has happened since I last took time to write to you. I can’t remember where to begin. The last week in Sept. I attended four meetings in Veedersburg, Oxford, Stidham and Delphi. I would leave home between 7 and 8 o’clock each day and be home by four or 4:30. Two days I left the meetings after the morning sessions and was home a little earlier. One day Clarence and Clara came at about six o’clock. They were going to attend the Progress show at Rensselaer the next day and couldn’t find a place to stay, so came here. I had just opened a can of soup and was thawing some hamburger, but changed my menu and had steaks and a few other thinks that made a fairly decent meal. We showed John’s pictures after dinner and since they wanted to get away early the next day went to bed early. Dad had to leave to go to the hospital, so he left just as we were ready to go to bed. Clarence & Clara got up so quietly the next morning, I just heard them as they closed the front door (5:30). Last week I was getting so much done on Monday and Tuesday (had taxes to figure, month-end book work to do, etc.) getting ready to take care of Becky from Thurs. to Sunday. Tuesday evening I unfortunately sprained the muscle in my right arm and had a rather painful time – couldn’t sleep because of the pain – for several days. I was so happy to have Becky with us, but was sorry I had to feel so uncomfortable while she was here. Sunday I decided to stay home because it was too hard on my sore arm to try to get in and out of the car with Becky. Putting her in the car seat was more than can be done with one arm. Rev. Fields took my S.S. class. My arm felt much better yesterday morning and I did a little too much in the way of using my arm and last night had a bad time again. I didn’t sleep very well after 4 o’clock. I am going to get another diathermy treatment this morning. Jo has quit working for Esta. She is working for Mingles at their factory in Goodland. Mark and Shirley got their moving done and took their refrigerator. The apartment they now have isn’t new and required a lot of cleaning and painting. Becky has a room of her room now. Mark thinks he will be able to get an accounting job by the end of this school term – February. They don’t particularly like the apartment they have now, but their rent is just about half what it was on N. Kenmore, so for the difference they feel like they can put up with less. I asked Mark how long he intended to live there and he said “one year” – that is now long their lease runs. He thinks by that time he will have a job that will pay him enough to afford a better place. We plan to go see them as soon as we can get the baby schedule cleared. Dad delivered a 2 lb. baby one day last week. HE thought it might make it, but last night he had a call from the hospital that the little fellow wasn’t doing so well. I haven’t heard yet this a.m. I find myself writing in the same style I use when writing to John – without paragraphs. We are waiting on the baby schedule to make our vacation plans. Had thought we would take the last week in Oct. and first week in Nov., but now we are just waiting for the babies to be delivered and plan from that time. I must get this finished and get to the office for my heat treatment. I saw Audrey Jackson last night. We were both attending a meeting of the Hospital Auxiliary at the Presbyterian Church. It is still so warm and we have had enough rain, the grass keeps growing. Dad has had to mow every week and sometimes more often since you have been gone. I have decided to give up the flower bed around the north side of the house, so he is sodding that space. It really looks a lot better and will be a lot less work for me. He says he is going to fill in the place where the violas are, since it is too low. He said he is going to take over that project next year, but won’t tell me what he is going to put there. Probably geraniums. At least every year he asks me why I don’t put geraniums there. 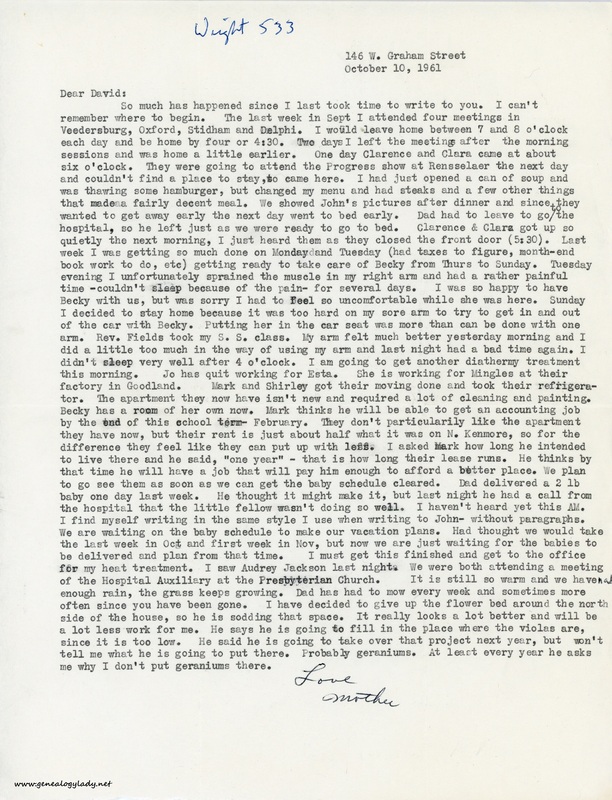 This entry was posted in Genealogy, Yegerlehner and tagged 1960s, Clara (Steiner) Yegerlehner, Clarence E. Yegerlehner, David A. Yegerlehner, Gladys R. (Foster) Yegerlehner, Indiana, Indiana University at Bloomington, John F. Yegerlehner, Kentland, Mark A. Yegerlehner, Mingle, Rebecca C. Yegerlehner, Rev. J. Robert Fields, Roscoe S. Yegerlehner, Shirley (Ward) Yegerlehner, Wright Quadrangle on September 25, 2016 by Deborah Sweeney. I must have read these letters when I first received them, of course, but I have no recollection of any of these events. Gladys did have arm problems…after the had moved to Lafayette she broke her wrist when she fell on ice. All this information about Mark, his jobs, their apartments, moves, etc., put him into an adult perspective, after reading some much about him as a kid in the WWII letters. Interesting how they had to plan their vacations around the schedule of babies due! “Jo has quit working for Esta.” I don’t know who Jo was, but Esta Harriman was the owner of the motel right next to our new house.